A slow tracking shot of a quiet room with curtains featuring birds brings us into Atiq Rahimi’s The Patience Stone. The tranquil setting is violently interrupted by a bomb going off. The blast is followed by gunfire that appears to be coming from just outside. 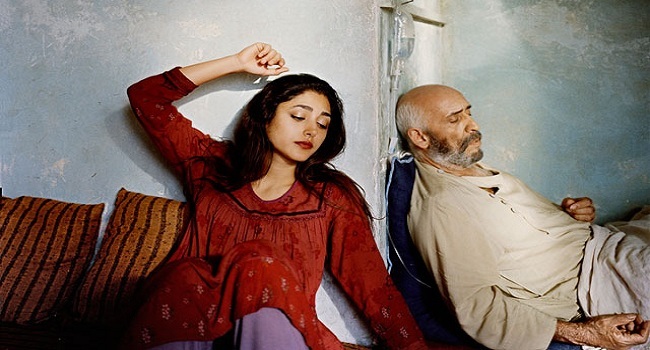 The scene then shifts to the two people in the room, a young woman (Golshifteh Farahani) caring for an older man (Hamid Djavadan) who is lying motionless. The woman prays over her husband and implores him to try and hold on. He is breathing but not able to hear, respond, or move. The woman is perplexed by this because the local Mullah advised her that he would be moving and talking by now. His vegetative state is a result of an injury he sustained in the ongoing war engulfing the town. Alone with her comatose husband, she starts to tell him her life story. She speaks of her childhood, her thoughts on their wedding, and the lust that his brothers had for her. She tells him things that she never would if he was conscious, but feels free to do so as he is in this state. When discussing her actions with an Aunt (Hassina Burgan), the woman is told the story of “The Patience Stone”. The Patience Stone is a mythical stone that you can tell all of your painful stories to. It absorbs them until one day it shatters leaving you free of all of your past problems. When another round of attacks hits close to home, the woman is forced to get her husband into a covered area. Unfortunately she is caught by two soldiers before she can escape. The unnamed woman lies to them saying that she is a prostitute to avoid being raped. The older soldier hurls insults at her before both men leave. However, the younger soldier returns later to force himself on the woman. The film takes an interesting turn as the relationship between the woman and the soldier evolves and power shifts. Director Atiq Rahimi brings a fine adaptation of his 2008 prize winning novel to the screen. The piece starts off slow, but as the woman begins to unburden herself sharing more stories that become increasingly detailed and personal, the narrative builds to dizzying heights. The screenplay written by Rahimi and co-writer Jean-Claude Carrière contains passages, especially those delivered by the Aunt, that are poignant and a strong commentary on the Muslim female experience. 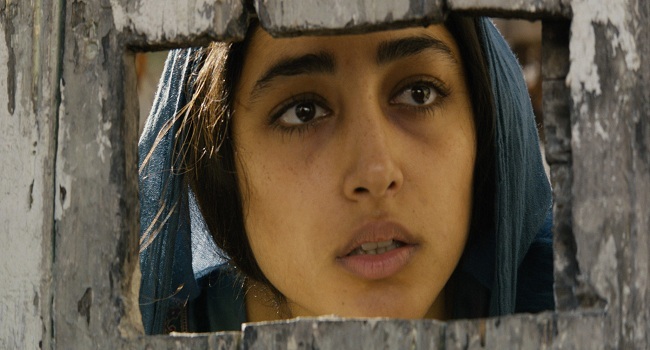 Golshifteh Farahani gives an excellent performance as the woman. Her role is pivotal to the film and she delivers. The part is difficult as she spends the majority of the film acting against a character who gives nothing back. She alternates between wanting to care for her husband and wishing he would finally die. Farahani brings one of the best acting performances of the year. Hassina Burgan is also strong as the Aunt, a woman who has vast knowledge about what it takes for women to survive in a strict Muslim society. Lastly, Massi Mrowat provides a nuanced performance as the young soldier who begins as the aggressor in his relationship with the woman, but evolves into something else by the end of the film. 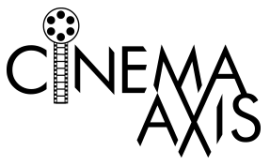 The Patience Stone is an intriguing film that will spark discussion about the roles of men and women in Afghan society. This is especially true when considering the strong commentary of both relationships between fathers and daughters, and the bonds between husbands and wives. The Patience Stone is a film that I can recommend.